I make no secrets on this blog about the artists I am feeling. And usually, the pattern repeats, as consistency appeals to me. This brings us to the latest work by Boston artist, Rite Hook. I have spoken to his appeal before but to recap previous posts, Rite Hook has great song making ability. He is able to put intelligent and emotional music together. He also has become a master at being able to construct dope hooks. His dark crooning really ties his songs together. The whole vibe of Draw You In is not so dissimilar to his previous works. It is just more polished. He certainly does, draw you in, and most of the places he is going to show you are dark and not-so-nice places. Rite Hook is certainly not the most optimistic person throughout the album, but he has an infectious negative energy that I just can relate to. But if you are looking for that ‘happy place’ music, you are going to have to seek shelter elsewhere. Rite Hook has also enlisted some pretty heavy hitters to guest on this album. Planet Asia and Copywrite provide cameos for the track, Walk This Town. The beat was provided by the incomparable Falside. I have spoken about the chemistry of Falside and Rit Hook before and it rears it’s ugly head again here on this track. Falside uses some sharp strings in layers to bulk this track up and it more than just works. It also needs to be said that Planet Asia has one of the dopest and most consistent flows in the game. He is just relentless on microphones. And when you combine his very polished mic skills with Rite Hook’s rapid fire delivery, and Copywrite’s multitude of dope punchlines, you have a track that’s simply hard not to like. Another track that I, among the many, I am feeling is She’s Crazy. Matty Trump laces the beat on this joint. He leads with some keys on the piano, then releases some subtle electronic noises for the chorus. It all it comes together perfectly. Rite Hook drops verses discussing how crazy he sees his first date is becoming. It’s a funny song and one that gets you singing along with the chorus, that is if you can identify with what the man is talking about (at least a little bit). So now it’s starting to show / She’s hoping I wouldn’t know / But I can see you clearly / I think it hurts her feelings / Sheeee’s craaaaazy…. Take A Picture is yet another example of a track that just draws you in (ahem) and won’t let you go. Rite Hook hits you up with a melodic flow and Matty Trump crafts a truly memorable beat on this one. It’s down tempo which seems to really suit Rite Hook. The track just has a good pace to it. Rite Hook touches on how easily forgotten we all can become. and how misconstrued we can become in the lenses of others. At least that’s what I derived from the track. The super-songstress Lisa Bello did an assist on the track as well, lending it even more soul. The title of the album, Draw You In, is very apropos to the content and the way it makes the listener feel. Rite Hook has the knack for concocting harmony in hip hop. It seems to me to be a very addictive style. One in which you are singing the choruses to the songs well after they are over. And to me that is the mark of someone who is making great and memorable music. There are plenty of dope cameos for this album. But those cameo’s fade into the background for the most part once you hear the songs, and the album, in their entirety. 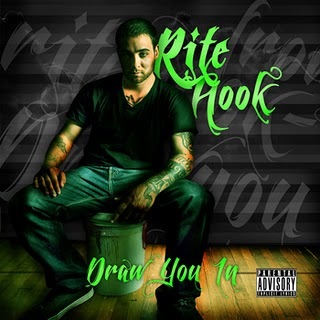 Not too many artists can pull off what Rite Hook is bringing to the art of hip hop. Definitely check it out.